Upon reading the latest report in the WSJ on natural gas engines, Hugo Tour, inventor of the opposed piston, split-cycle Tour Engine, had a few words to say about dual fuels and the advantage of his engine technology approach. Although I have written back and forth with Hugo Tour (left in photo, with Oded, his son, on the right) on a number of occasions, I finally met him in person at the 2012 SAE World Congress in Detroit. I’m honored to say that he emailed me today and assured me that my support of the vision of the split cycle engine technology is still founded on practical design and concepts. 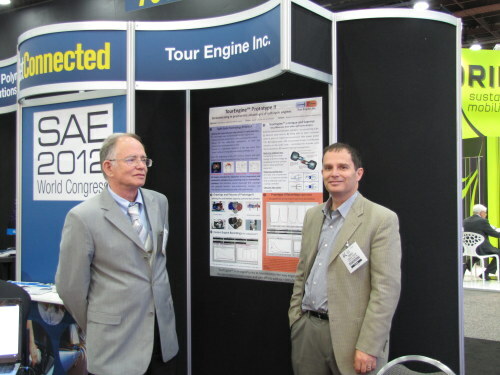 For ref, read - Tour Engine Prototype 2 operational before SAE World Congress. First things first, though. The Wall Street Journal (WSJ) article, "America, Start Your Natural-Gas Engines" struck a chord with Hugo Tour. It stated how the recent deluge of low-cost shale gas is already changing the way the country views this energy resource. While electric utilities are turning to gas to power their turbines, truck carriers are investing in conversion for the big rigs, and many chemical companies that rely on the fuel are coming back to America after years of investing overseas. In my own view, if America fails as a nation to take advantage of natural gas, those gas reserves will most likely be sold elsewhere. No wonder the old adage that America too often starves with two loaves of bread in its hands seems so true, especially when we apply it to energy resources. Of course, there are infrastructure challenges, but not insurmountable as people think. The WSJ did state that public refueling stations are few and far between; and that is true. However, in my view, that is changing with the increasing number of stations along the interstates which will feed the fuel for the big rigs that convert. In praise of the WSJ article, I like the idea that it didn’t hold back. Author, Tom Fowler, is to be commended for being bold enough to lay out all sides, a rare trait in a world where shades of green and the press contend with anything with fossil remains in it. While natural-gas cars are indeed more expensive than gasoline models, sometimes to the tune of thousands of dollars, be apprised this is without government subsidies of the same magnitude as EVs. Trucks, on the other hand, have the advantage of writing off the expense as a business deduction; and they withdraw most from our oil supplies. The WSJ stated the only natural-gas passenger car sold in the U.S., the Honda Civic GX, costs about $5,200 more than a comparable gasoline vehicle and $3,600 more than the gasoline/electric hybrid Civic. I have to ask: Why so much? WSJ also stated that adding the compressor and storage tanks needed for a CNG station can drive up the price there by as much as $500,000; and that’s IF the station can even hook into a natural-gas distribution pipeline. Still, in my view, we will have little economic choice but to go the dual-fuel route, at least until that infrastructure matures. For sure, the cost of lithium-ion batteries are far from what the masses can really afford. Moreover, the cost of easy oil is becoming prohibitive as time goes on, despite our shale deposits and deep drilling technology in the oceans. So, the tech question of the day is this: Which engine technology best avails the dual-fuel approach? And which will best help the auto industry attain the 54.5 MPG by 2025? And I agree with him. That is why the automotive OEMs are still striving to improve the efficiency of the internal combustion engine; albeit not fast enough to suit me. After all, the gasoline infrastructure is in place. However, transitioning to natural gas will likely lead to dual-fuel vehicles for quite a while. And the question is, which engine technology is best prepared, cost efficient, and thermodynamically efficient? Tour also noted that while operating a multi-fuel vehicle, each fuel has its own optimal compression ratio (CR) for best efficiency and performance; and that is key here. Frankly, I had not thought of that advantage until Hugo pointed it out; another kudo for Tour Engine. Question is, how long before the automotive OEMs stop tinkering with their incremental tech gains and go for the big gains by splitting the cycle of the 4-cycle engine? Note to the tweets that wanted to know about Scuderi: Fact is, Scuderi is also a split cycle, but it has a single crankshaft. Hugo Tour's comments obviously apply to Tour Engine which has two crank shafts. Besides, it was Hugo who initiated the article via his email. Scuderi has yet to respond to the WSJ article as of this date as far as I can tell. Frank, I don't know if you already know about this, but it looks like GM will also have a patent on a split-cycle engine that has the compression and power cylinders on separate shafts. (If you search 'Google Patents' for '12/724461', you can view the patent application.). Their design also includes an 'expander' cylinder, presumably to extract energy out of the combusted gases before they go out the exhaust. (This is apparently the 'discrete-compression/discrete expansion' concept Alan Taub from GM mentioned last Ocotober.) According to the US Patent and Trademark Office website, GM was mailed a 'Notice of Allowance' for this patent application on 5/29/12. (You can view the transactions for this patent application at the 'USPTO Public PAIR' site. When you get to the ‘Search for Application’ screen, enter the application number ’12/724461′. ) I don't know if GM has prototyped this engine, or whether it only exists on paper or in simulations. They showed at least some interest in the split-cycle concept in getting this patent, but I wonder how much they are going to pursue it? Frank, Recumbentrider. Changing split cycle engine compression ratios in said engines configured to have a third chamber (connecting tunnel) placed between two crossover valves can not be accomplished solely by manipulating crankshafts relative phase angle. To begin with, those engines normally compress up to an extremely high CR (which later is partially released). Frank, thanks for the educating article. Hi Fox, Not all split-cycle are alike. In fact the Tour cycle is VERY different from lets say Zajac or Scuderi.The Tour design does not have a "connecting tunnel" and the compression ratio in the current prototypes is 8:1 The following text is the website under technology: "The head-to-head configuration permits the direct coupling of the Cold and Hot cylinders and eliminates the need for a connecting tube. The absence of a connecting tube ensures minimal pressure loss and the dynamic and efficient transfer of the complete compressed charge between the Cold and Hot cylinders." You can find on the web news section more articles that explain the technology potential. Did the WSJ article mention anything about Westport Industries? They have developed a fuel injector that converts diesel engines to run on Natural Gas. They have reportedly inked deals with GM, Cummins, and one of the largest diesel engine producers in China.